Probate records exist in places and for time periods when few other records are available. Estates were probated for about 25 percent of the heads of households in the U.S. before 1900, whether or not a person left a will specifying how to divide their estate. When a person who has left a will dies, a probate court carries out the will’s instructions. In some cases, this occurs even if a person dies intestate, or without a will. The judge makes the final decision regarding how the estate is to be distributed, taking into account the validity of the will and the legal demands of creditors. Settlement Papers—give a final accounting of the division of all the property to the inheritors. 1) Use microfilm from the Family History Library. Check the FHL Catalog for the County, then look under Probate to see if the records are available. 2) Use the mail. Write to the county courthouse. Give them the name of your ancestor and his death date. Request a copy of his complete probate packet. 3) Visit the courthouse. You can visit county courthouse and search the probate records yourself. Or, you might try contacting a local genealogical society to see if there’s a person who can visit the courthouse and do some research in your behalf for a small fee or donation to the society. Anyone of legal age, sound mind, and freedom from restraint had the right to leave a last will and testament. Nearly 10 percent of the pre-1900 adult population made one or more wills. Males with valuable property were more likely to have left a will. Because wills often list the names of many family members, as much as half the population either left a will or was mentioned in one. An individual who left a will is said to have died “testate.” Someone who did not leave a will (or a valid will) died “intestate.” The probate process is essentially the same for both. The complete process may have required several years. The probate process began with the filing of a petition by an heir, creditor, or other interested person. A petition is an application to a court requesting the right to settle an estate. The petition was filed with the court that served the area where the deceased owned property. Additional petitions may have been filed in other localities where he owned property or resided. The petition may name the heirs of the deceased, their relationship, and sometimes their residence. If a will was available, it was then presented to the court with the testimony of witnesses as to its authenticity. A will is a written and legal expression of the individual’s instructions regarding his property at the time of his death. The will usually describes the estate and often gives the names and relationships of heirs or beneficiaries. The affidavit of the witnesses includes the date or proof of death. If accepted by the court, a copy of the will was recorded in a will book or register kept by the clerk of the court. 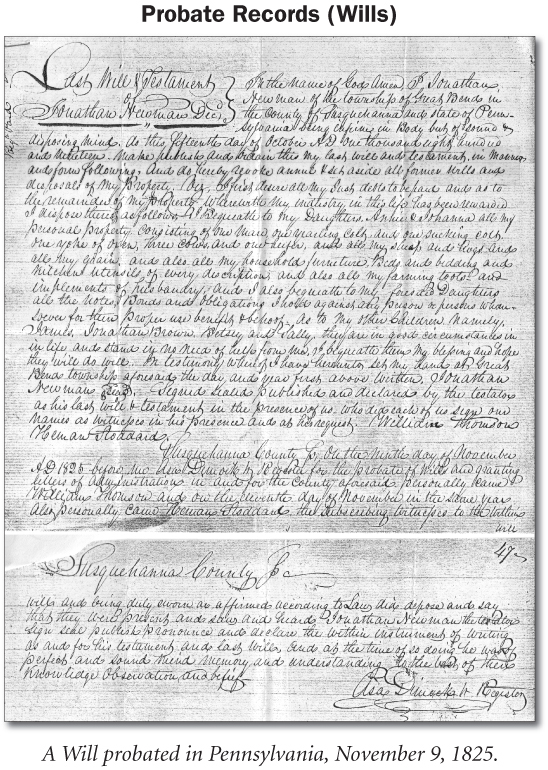 The clerk may have made errors when he transcribed the will, but the original will is often kept in the probate packet. The court then appointed an individual to “settle” the estate. The will usually named an individual whom the deceased wanted to serve as “executor” of his estate. The court authorized the executor to proceed by issuing letters testamentary. If there was no will, the court appointed an “administrator” instead, by issuing letters of administration. These letters may include the death date. The date of the letters is sometimes used in place of an actual death date. The administrator or executor was usually an heir or a close friend of the deceased. He may have been a creditor. In most cases, the court required the administrator (and sometimes the executor) to post a bond to ensure that he would properly complete his duties. The bond required the administrator to pay a fee to the court if he failed to adequately administer the estate. One or more persons were required to co-sign the bond as “sureties.” These individuals were often members of, or closely associated with, the family. An appraiser then prepared an inventory that listed the property in the estate and obtained an appraisal of its value. In intestate cases the inventory is very important as it may describe the land, tools, slaves, and other personal property at the time of death. These records are sometimes transcribed in the will books or in separate volumes, but the originals may be in the probate packet. After receiving the inventory and appraisal, the court ruled on how the estate was to be distributed. If there was no will, the estate was divided according to the laws of the state. The court then authorized the executor or administrator to distribute the estate. The administrator or executor may have had to first sell some of the property to clear any outstanding debts. He submitted accounts to the court of all transactions pertaining to the administration of the estate. These records can identify persons known by the deceased during his lifetime, including family members, friends, and creditors. When the distribution was completed and payments to the creditors and heirs had been made, he presented to the court a record or decree of distribution and settlement. This listed the beneficiaries of the estate and the property each received. This is often the most helpful source of family information in an intestate case. The clerk of the court retained all the original documents pertaining to a probate case in a probate packet or probate estate papers (also known as “estate packets,” “case file,” or “estate files”). These contain the original wills, petitions, letters, bonds, inventories, settlements, and other records. Copies of some or all of these documents may also have been recorded in separate books. The court may have appointed a guardian to care for minor children or incompetent adults. In some cases a parent was appointed as the guardian for his own child. Sometimes male relatives were made guardians even though the mother was alive. The records may include letters of guardianship (appointment of a guardian), bonds, sale of property (to provide for a minor’s needs), accounts (account of the guardian’s services and support in behalf of the minor), and a final account when the child comes of age and a guardian is no longer needed. Records of guardianship may be kept separately from other probate papers, or a different court may have jurisdiction over guardianship.